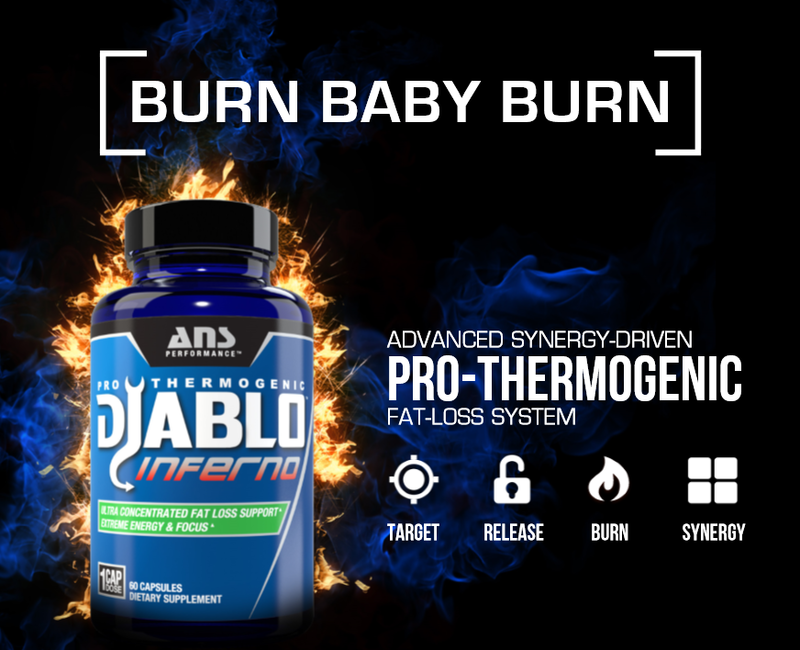 DIABLO INFERNO delivers an unmatched thermogenic experience. A synergistic blend of concentrated ingredients that target stubborn visceral and subcutaneous fat to support fat breakdown, improve fat transport to the mitochondria and elevate fat utilization for energy and heat via thermogenesis. * You can literally feel your body-heat rising as INFERNO targets and destroys stubborn fat. * DIABLO INFERNO ignites your physical and mental energy and provides a long lasting crash-free, jitter-free experience. TEACRINE®: TeaCrine® is a nature-identical version of the compound Theacrine, which is found in Kucha tea. It works with the body’s natural metabolic processes to deliver longer lasting energy, increase mental clarity and improve mood and motivation. Directions: To assess tolerance, start by taking 1 capsule in the morning with a glass of water for the first 2-3 days. Once comfortable, proceed to take 1 capsule in the morning, and 1 capsule again in the afternoon. DO NOT exceed 1 capsule per serving. DO NOT exceed 2 capsules in a 24-hour period. 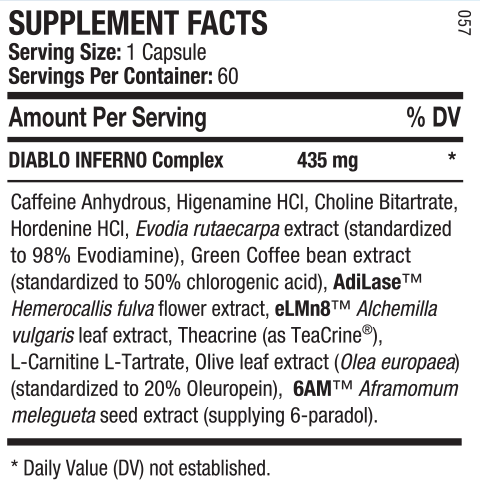 For best results take Diablo Inferno combined with proper diet and training. Do not take within 5 hours of bedtime to avoid sleeplessness. Read entire label before use. Warnings: Not intended for use by persons under 18. Do not use if pregnant or nursing. Discontinue use and call a medical doctor if you experience unusual symptoms. Consult a medical doctor before use if you have been treated for, or diagnosed with any medical condition, or if you are using any prescription or over-the-counter drug(s). This product contains caffeine. Caffeine sensitive individuals may experience the following symptoms including (but not limited to) restlessness, tremors, headache, anxiety, palpitations, increased heart rate, or difficulty sleeping. Do not combine with other sources of caffeine. Consult a medical doctor before starting any diet or exercise program. Do not exceed recommended serving. Improper use of this product will not improve results as is not advised. Use only as directed. KEEP OUT OF REACH OF CHILDREN.